I was born and raised in London, England and have been a lifelong member of the London Jamaat. Although FGM has been illegal in the United Kingdom since 1985, myself and many other girls have been subjected to this barbaric ritual, despite it being outlawed. 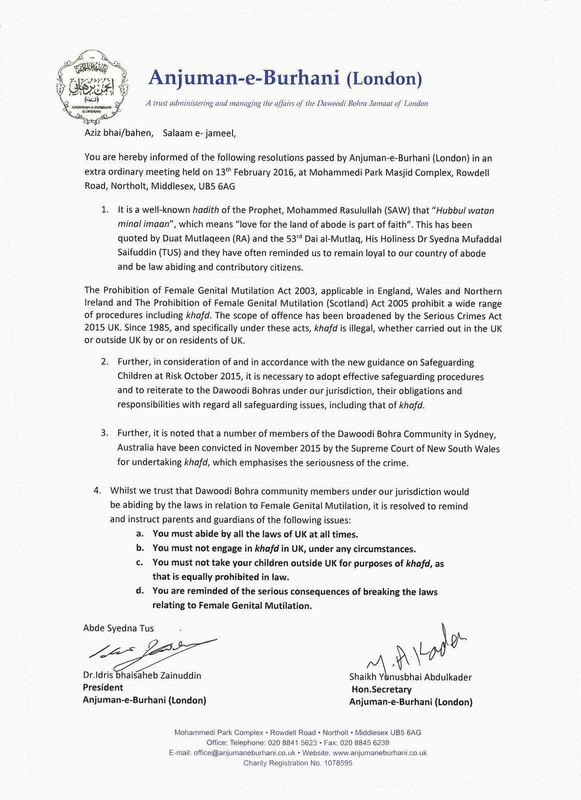 After the Australian court case and subsequent convictions for circumcising two minor girls, the Sydney Jamaat issued a notice urging followers not to circumcise their daughters in Australia or abroad. On February 15th, the London Jamaat followed suit and issued a similar notice. The letter, similar in wording to the one that was issued by the Sydney Jamaat, points out that Islam mandates that its followers be loyal, contributing citizens who abide by the law of the land in which they reside. Despite the UK law explicitly stating that it is illegal to take a UK citizen outside of the UK for the purpose of circumcision, I know of many minors who were circumcised while abroad. It is important to note that this has also been addressed by the letter issued by the London Jamaat. It states that “You must not take your children outside UK for purpose of khafd as that is equally prohibited by law”. The London Jamaat is the first Jamaat after Sydney to publicly discourage followers from performing this procedure on girls. Although this is a huge step in the right direction, the notice that was issued does not condemn the practice itself, but rather it discourages followers from breaking the law. As a woman who has undergone this barbaric ritual, and on behalf of all of the other women who have suffered, do suffer and continue to suffer, I hope that this is the first of many Jamaats to follow suit and finally stamp out this practice. I thank the decision makers of the London Jamaat for taking this step and I sincerely hope that my generation is the last generation to lose a pinch of our skin. The Sydney and London Jamaats are urging followers to obey the law of the land.A step in the right direction no doubt but the clergy needs to discourage this barbaric ritual.We need to keep up the pressure on that and in India especially get the government to have a law in place banning the practice. Having been subjected to this horrifying ritual some 52 yrs ago myself,the trauma that I underwent then,is still vivid in my memory. I don’t think any girl who has subjected to this can ever forget it. There may be some who would try to sweep it under the carpet and not acknowledge it but can never forget.